All of the stuffed penguins and plush penguins at Stuffed Safari have happy feet and happy faces! 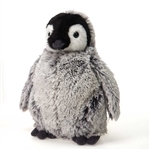 Whether you're looking for a stuffed Emperor Penguin or a plush Black-footed Penguin or even a plush penguin puppet you're sure to be happy with our great selection of penguin stuffed animals. We have stuffed penguins of all ages for all ages! That's right, from plush penguin chicks to adult stuffed penguins and even adult penguins with chicks, we have stuffed penguins for everyone. And really, shouldn't everyone have their very own plush penguin? We think so. If we didn't this whole website would be pretty silly, now wouldn't it?! Just scroll down to see all of our stuffed penguins and plush penguins but don't forget your jacket and mittens. Oh, and grab a scarf, these penguin plush animals like it cold!